(From Deb). One of the graduate courses I enjoy teaching is Technology for School Counselors. With each website we view, we also discuss different lessons or activities for which we might use the tool. Recently, we discovered two different sites that could be the focus of lessons for middle school students. Keep in mind that both sites would be units within a weekly curriculum entitled “Getting to Know Yourself”. Let’s begin with the first site: http://vizualize.me/. You can either create an account, or use information from LinkedIn, as a professional. For middle school students, use the questions in the profile builder to enter information so they can create their visual board. Once completed, the board would be an amazing visual of a resume! Discussions can be on different skills each of the students have, languages spoken, interests and so much more! Here is a portion of the sample of the infographic done on my profile! Connect the visualize.me infographic with a career inventory students will take or may have taken. There is so much potential for this lesson to really show students the importance of education and how different skills are all necessary! So much potential! The second lesson in “Getting to Know Yourself” aligns with social media. The app is called GetAbout.Me and provides a report of activity in social media. 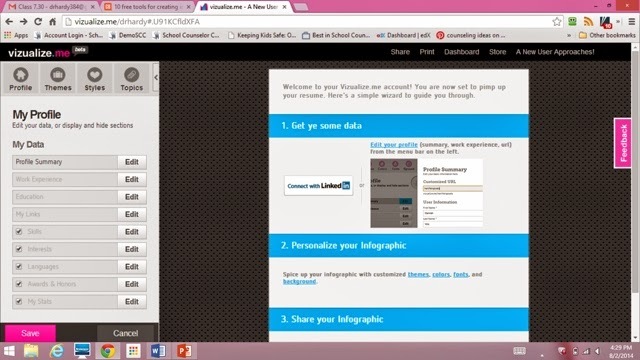 I was so excited that this tool could not only address the issue of how students are perceived with social media, but could also be aligned to the Math curriculum given the graphs that are given in the report! When was the last time you did a school counseling lesson in Math class? One of the graduate students in my class is a Math teacher and was so impressed on the idea of connecting graphs and social emotional topics! 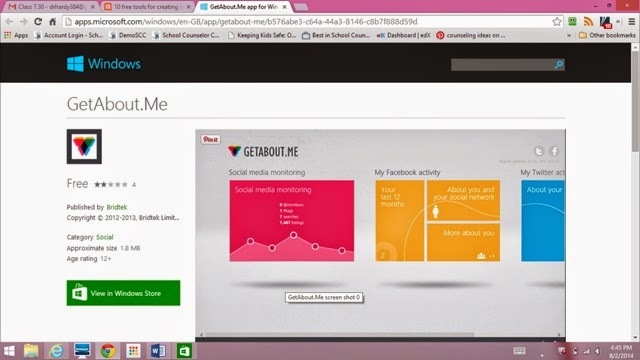 Think about collaborating and asking students to graph for a week their social media activity. Without asking about specific postings, ask guiding questions related to reviewing a graph: what do you, as a student, see in your graph? What are the times in the day that was most active?Which social media tool is most likely to be used by middle school students? We all depend on the exchange of information and use of the tech tools, but it is important to remember that it is only a tool. There are so many resources to support our work as school counselors and engage students! Have fun and I would love to hear from you as to how you have used the websites above. In addition to teaching grad students, Dr. Deborah Hardy is not only a Director of K12 School Counseling Services in NY, but is also the creator of School Counselor Central, www.schoolcounselorcentral.com. School Counselor Central is the only web based program that supports the management of a comprehensive school counseling program (Mission, Vision, Advisory Council minutes templates), has a lesson writer aligned to National Standards of School Counseling, and runs reports related to school counselor tasks, student meetings and interventions. School Counselor Central has 7 of 12 required RAMP components as part of the program. 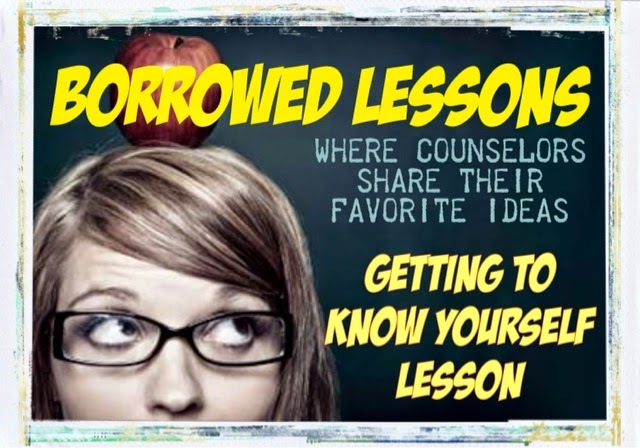 Ask for a free demo atwww.schoolcounselorcentral.com. School Counseling, It's What We Do! I'm pleased to know Deb as both a friend and colleague. She always has something to teach me.